Description: The Undead are Still Not Dead in Zombocalypse 2. 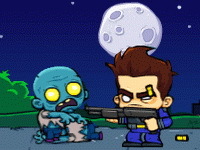 Use your huge arsenal of weapons to survive the zombie onslaught. Aim well and get rid of the Springfield enemies. Help Bart Simpson shoot his enemies, and see how many you can kill.